A big hello to all you dogs (Ok, and cats too!) out there, reading the JOHN W BROWN'S blog, while your families remain clueless to how smart pets are (but, hey, that's another blog for another day). I've recently had a chance to get onto some other boats, and I thought I'd share some pictures. My humans have some crazy system of storing pictures, because I can't find the pictures of my handsome self on the PRIDE, but I will share some summertime boat adventures with you as well as some of my favorite boats. This summer I spent over a week in upstate New York and had a chance to get on the EDWARD M. COTTER out of Buffalo, which is the world's oldest working fireboat. Built in NJ in 1900, she is still in use by the Buffalo Fire Department and the City of Buffalo as that city's only ice-breaker. As you can see, I was ALL over that ship...heck, as soon as I heard them tell my people that I was allowed on board, I was already getting on and exploring. We also got to live on a Canal Boat for a week while we went down the Erie Canal. Not only did I get to BE on a boat, but I got to see all kinds of canal boats and tugboats. As you can see, I'm pretty comfortable on them all... 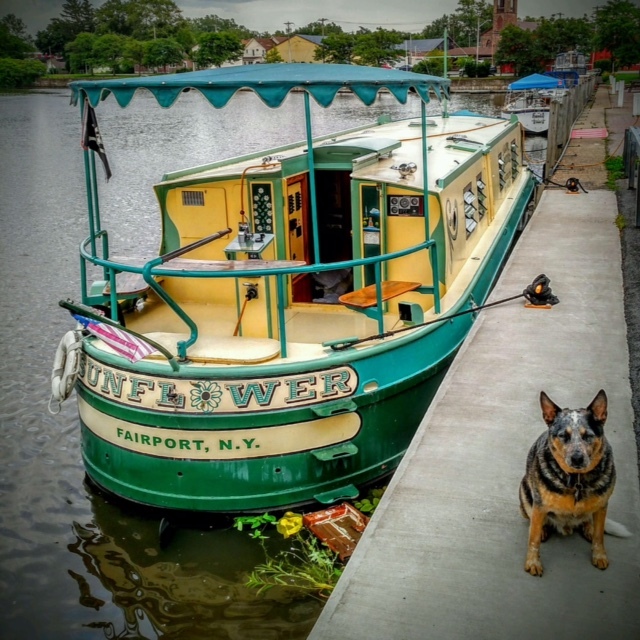 In Lockport NY, the lock keeper told my humans that they have seen lots of boat dogs, but they have never seen such a well behaved dog before. They were impressed with my superhero lack of fear...I stood on top of the actual lock gates and watched as the boats magically went up and down. Ok, so now that you got a chance to see some of the things I did this summer, I'm going to share some other pictures of my favorite boats. Below is my visit in March to the KALMAR NYCKEL in Delaware. I was not allowed on board because of the work they were doing, but kept trying to sneak on and see their cat. Sorry about that last picture...my mom forgot to change her exposure. Jeesh... must I supervise everything around here?!?! Then, below that, are some pictures of one of my favorite kinds of boats Army T Boats built during WWII (this is the Knock-Na-Shee). Stay tuned for more BROWN travels. Coming up, the BROWN will move down the street (Next to the N.S. SAVANNAH) for the Labor Day weekend to celebrate the end of WWII with a focus on Maryland. Open Friday-Sunday, the engines will be steaming for the public on Saturday.